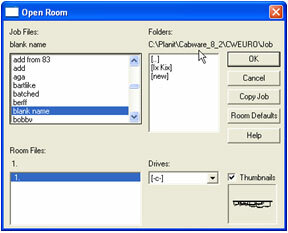 Although the Copy Job feature is primarily used for making a copy of a job under a new name, it can also be used for transferring jobs between computers or different versions of the program. 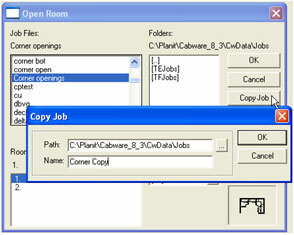 To copy a job within the same folder, select the Open Room Menu or the Open Room toolbar icon. Select the job to copy. Click on the Copy Job button. Supply a new name and click OK. You can’t copy a job to itself. To copy a job from another folder, select Open Room, and then click on the brackets with two dots, [..], to select a different folder to copy from. Navigate to where the job is located. In this case I selected back to Planit\Cabware_8_2\Cweuro\Jobs. Click Copy Job and then the [..] symbol to navigate back to C:\Planit\Cabware_8_3\Cwdata\Jobs\TEjobs or wherever you want to copy to. You can also make a New Folder at this time and select it to copy to. Choose OK and you should see a message about the job being copied successfully. You can also copy a job to another computer or drive on your network. Just select the job to copy and then Copy Job. Navigate to the Drives: drop down and then select the drive and folder you want to copy the job to. Click OK to finish copying. (Copy Job is a function of Cabnetworks, the Detailer, the Designer and the Case Planner V 8.2 and later).